If you are a school district superintendent, a principal of a public or private high school, a school counselor, part of a high school’s college awareness program (including GEAR UP, UPWARD BOUND, AVID, TRIO, etc.) 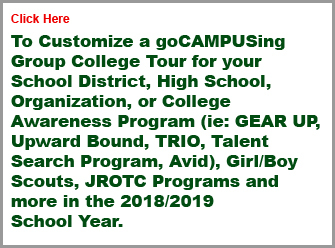 or a schools JROTC PROGRAM, or a member of a parent teacher organization, goCAMPUSing can offer you and your college bound high school students a tremendous opportunity to discover and experience the college selection & application processes. 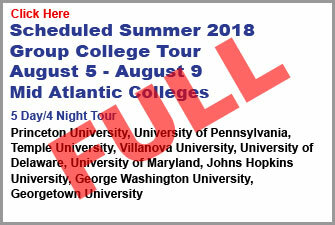 Many high schools have turned to goCAMPUSing to supplement and work in conjunction with their college preparation programs for their students. As you know, the sooner students are exposed to what college is all about, the better prepared their students will be when they apply to college. As early as freshmen and sophomore year, goCAMPUSing helps students realize what classes will increase the rigor of their schedules to improve their chances of getting into the college of their choice. Additionally, juniors and rising seniors discover, first hand, things they never knew about the differences in colleges. This makes the college application process less intimidating and opens their eyes to colleges that they never had on their radar. 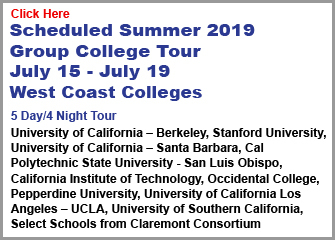 High schools can opt to place students on existing scheduled goCAMPUSing College Tours, or arrange for a customized college tour. Tours can be developed specifically to the level of your high school’s students. 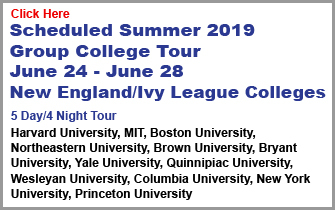 We always suggest a broad brush approach to any of our college tours including a variety of colleges – big, small, urban, suburban, Ivy League, and hidden gems. goCAMPUSing has taken thousands of high school students on college tours throughout the country. We’re experienced and possess an intimate knowledge about the hundreds of colleges we visit every year. And most important to the kids on the goCAMPUSing college tours, is that we make the experience fun too! So, if you want to offer your high school students an educational field trip with the opportunity to get you students into the colleges of their choice – goCAMPUSing. We’re happy to develop a college tour program that will fit all the needs of your student population. Please call (516) 941- 6992, or email info@gocampusing.com and we’d be happy to answer all of your questions and set something up with you!